This collection is tailor-made for geeks such as me. I love to read, with science fiction and dark/horror fiction being at the top of my reading list, but I also love to play games. Board game, card games, even some video games (though I’m not very good at them). So…fiction with a game theme and running to darker, edgier side, is perfect for me. Editor Jonathan Oliver has collected some remarkable talent and wonderful stories for this anthology. The book starts off Chuck Wendig and his “Big Man.” I’ve become quite a fan of Wendig’s work and I enjoyed this story, although the theme of car rage has been done by some pretty impressive names already: Stephen King, Roger Zelazny, and Harlan Ellison just to name three of my favorites. “Die” by Lavie Tidhar is possibly my favorite story in the collection. Although a little darker than most of the works, this one has stayed with me the most. In the story, two people enter a room empty except for a table, dice, and a weapon. They roll the dice to decide who must kill the other person with the weapon. Not fulfilling the duty results in some nasty repercussion. “The Bone Man’s Bride” by Hillary Monahan reminded me in some abstract ways of Shirley Jackson’s “The Lottery” though this story is very fresh and offers up some interesting twists. I am not familiar with Monahan, but I look forward to reading more by this author. Tade Thompson is another name I am not familiar with, but his “Honorable Mention” was another powerful story with an interesting twist to it. Although, like most anthologies I’ve ever read, the stories within vary in terms of quality and the interest they build for me, but this collection has few – if any – true duds. I think editor Oliver has done a real fine job of grabbing some real talent for this collection. Looking for a good book? 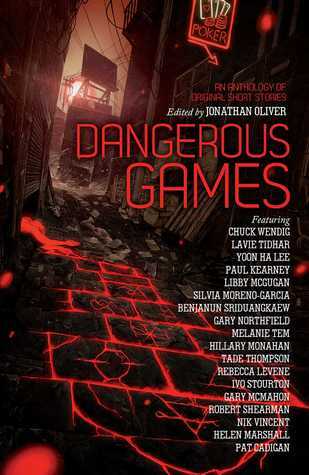 Dangerous Games is a wonderful collection of dark fiction centered on a theme of game playing, edited by Jonathan Oliver.